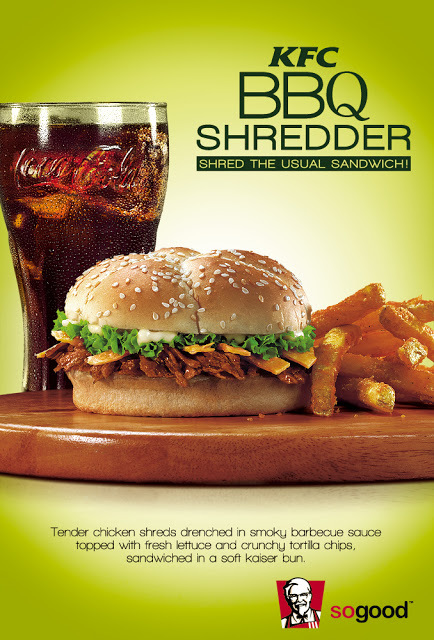 The BBQ Shredder Sandwich is the new KFC sandwich that contains “tender chicken shreds drenched in delicious smoky barbecue sauce.” This is the newest sandwich for this year that will everyone surely enjoy. The price is P55 for ala carte and P85 for combo meal. And for me, I will never miss the chance to taste it and enjoy it every bite. Meanwhile, KFC Philippines made it to the popular website Huffington Post twice last year for its unique offerings. Comments or suggestions about "KFC BBQ Shredder Sandwich for 2013" is important to us, you may share it by using the comment box below.